UPSC CISF AC LDCE Admit Card 2018: Download UPSC CISF AC LDCE Admit Card for the CISF AC (EXE) Limited Departmental Competitive Examination, 2018 to participate in Personality Test (PT)/ Interview w. e f. 16th July, 2018 to 19th July 2018. Selected contenders have to participate in Personality test/ Interview for Central Industrial Security Force AC (Exe) Limited Departmental Competitive Examination, 2018 at Union Public Service Commission, Dholpur House, Shahjahan Road, New Delhi-110069. 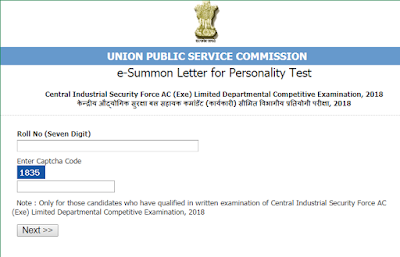 Contenders can download UPSC CISF AC e-Summon letter for Interview/Personality Test till July 19th, 2018 3:00 pm. In order to download UPSC e-Summon Letter for Personality Test, you need to enter Roll No (Seven Digit) and Captcha Code. Only qualified contenders in Central Industrial Security Force AC (Exe) Limited Departmental Competitive Examination, 2018 can download UPSC CISF AC LDCE Interview Admit Card 2018 by going through this page which is designed by www.privatejobshub.in. How to Download UPSC CISF AC LDCE Admit Card? After that, contenders have to move their cursor downwards on the home page to download UPSC CISF AC Admit Card 2018. Hit “e-SUMMON for VARIOUS EXAMINATIONS OF UPSC” link available on the home page. A new page will be displayed at your computer screen and you have to press “Download” link. Thereafter a new page will be displayed asking various details to get UPSC CISF AC LDCE Admit Card 2018. Enter asked details in appropriate manner and hit “Next” tab to download UPSC CISF e-Summon letter 2018. Finally, UPSC CISF AC LDCE Admit Card 2018 will be shown at your computer screen. Download UPSC CISF AC LDCE 2018 Admit Card or save UPSC CISF AC LDCE Interview Call Letter 2018. Take a print out of UPSC CISF AC LDCE Hall Ticket 2018 and bring UPSC CISF AC LDCE Personality Test Call Letter 2018 at the examination on scheduled date. Contenders are required to bring following documents along with them while participating in Interview round. A PwD certificate if claiming relaxation under PwD category. Check this Official Link to download UPSC CISF AC LDCE Admit Card 2018 while you may check this page also. Contenders are suggested to be in touch with us by subscribing our free email service or following us on Facebook and Google plus for more updates.